Projective geometry was developed prior to the 20th Century and there are two main approaches: algebraic and synthetic. The former method maps projective objects and processes onto linear algebra, using matrices and vectors, which at one time led to the view that the subject was "dead" as all that could be said was said by that algebra. The synthetic method uses the axioms of incidence to study the subject directly in terms of points, lines and planes and is essentially pictorial in nature. The latter approach will be adopted here, and it will be seen that far from exhausting the subject, the algebraic approach may even obscure important developments if care is not taken. That is not intended, however, to detract from the importance of the latter. We will not attempt to develop the ideas with full rigour as that has been done elsewhere and need not take the excessive amount of space required on a page such as this, so an informal approach will be presented to give some intuitive insight. Proofs may be found in the references cited. On the left we start with an axial pencil of blue planes (i.e. they share a green line) and a black plane sigma. The blue planes meet the plane sigma in four black lines forming a flat pencil (lines in a plane through a common point). A is the centre of this pencil. We take a second green line through A as the axis of a second axial pencil, the planes corresponding to the blue ones being shown in red. Now we dualise this on the right:- first take the black point S dual to sigma and another plane alpha dual to the point A, which must contain S as A lies in sigma. We now start with a blue range of points i.e. a set of points on a green line dual to the axis of the initial blue axial pencil. This line lies in alpha because that axis contains A. We then project those points, using a black flat pencil in S, onto another range of red points necessarily lying on a green line in alpha. This illustrates the principle of duality in three dimensions in respect both of dual elements (points and planes) and dual operations: namely putting two axial pencils of planes in perspective, and putting two ranges of points in perspective. We say two axial pencils are in perspective if they contain a common flat pencil, and similarly for two ranges if they determine a flat pencil when corresponding points are joined. The same applies for ranges in two dimensions, but then the dual is that two flat pencils are in perspective if the points of intersection of corresponding lines lie on another line (see Figure 1). It is important to note that making a point at infinity fixed ushers in the metric case. There is just one point at infinity on a line, sometimes known as an ideal point because in ordinary geometry it does not exist, but in projective geometry it is added to the line. Generally two distinct lines meet in one point unless they are parallel, but in projective geometry two such lines always meet in just one point, the latter being the ideal point if they are parallel. In three dimensions two distinct planes always intersect in a line, which is an ideal line if they are parallel. Again the use of infinity enables measurement, as successive steps form a geometric series i.e. successive pairs of points determine distances from the accessible double-point that are always in the same ratio. This is known as a growth-measure. Just as a quadratic equation may have two roots which are complex numbers e.g. the equation for the intersection of the line and circle above, so in this case we have two so-called imaginary points for the double-points as they cannot be located on the line in the customary sense - even at infinity. If the circle intersects the line we recover breathing measure, while if it touches it we have step measure. We start with two red lines in the plane, and wish to find where they go when the transformation is applied. The two black lines are two sides of the invariant triangle, and a breathing measure is constructed on each. This suffices to determine the whole transformation, and by finding where the points go in which the red lines meet the black we can find the brown and dark-cyan lines which are the transforms of the red ones. To illustrate another point, we took the red lines parallel to show that in general parallelism is not conserved by such a transformation. We may transform points in the plane similarly, which will be illustrated below. We show the dual condstruction where a red line is moved repeatedly to give the tangents to the curve. This egg form has been shown by Lawrence Edwards to fit the profiles of plant buds, birds eggs, fir cones and more (see the Research Page). We will look at the quantitative aspect later. We have marked the centres of the pencils as P and Q, and we start with the line A' through Q. This meets the circle in a point through which we draw the line B of the pencil centred on P. The line through Q meeting this line at infinity is the line B' parallel to it, and the next line C through P meets it on the circle, and so on (c.f. Figure 7 where the process is illustrated for many more lines). The two angles theta are equal because they are in the same segment, and hence the angles between B and C, B' and C' also equal theta i.e. the transformation causes the lines of the pencils to move successively through equal angles. This angle theta will prove to be most important when we come to quantitative calculations. But we could have placed the circle and the points P and Q anywhere in the plane, with the same result! It follows that a line through the real double-point of the transformation we seek will rotate through equal angles as the transformation is repeated, as this must happen to all pencils in the plane. The angle theta is the argument of the complex numbers which are the coordinates of the double points. We have shown it superimposed on a Nautilus Pomp. 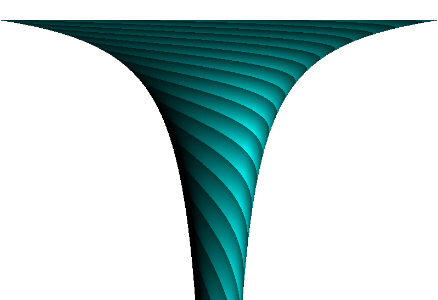 shell; the path curve is a logarithmic spiral. This is because the the radii of such a spiral increase in geometric progression with equal angles turned. The first few points on the curve have been related to the construction by the small white circles. Next we observe that the spiral intersects any radius in points forming a geometric progression, so the top and bottom black lines of Figure 10 may be regarded as planes seen edge on, with a spiral in each plane determining the points of the construction. We will now use this for a full three dimensional transformation of space. There are two special cases, obtained if either the top or bottom invariant plane is moved to infinity. The above picture shows the case with the bottom plane at infinity, giving a profile that accurately fits water vortices when the parameters are chosen suitably. The other case looks more like a tornado. where x is the multiplier in the top plane and y that in the bottom one. The parameter lambda is defined to be positive for eggs, and the fractional value for one of the multipliers then implied by the negative sign corresponds to the opposite sense of the spirals in Figure 14. Note that lambda does not control the maximum width of the egg in proportion to its height, but it does determine the relative height at which the radius is a maximum. The effect of lambda on the shape is shown on the Research page. For vortices lambda is negative and its effect is also shown on the Research page. For further information and examples you may refer to the "Basic" and "Path Curve" pages in Projective Geometry, as well of course to the pioneering work of Lawrence Edwards.